Pictured below is a target shooting controller which we recently made for a shooting club in Australia. We had previously made them a controller with fixed time series – for example, Standard Pistol 150s, 30s, and 10s, Centre Fire face target 3s then away for 7s repeating 5 times, and Rapid Fire 8s, 6s, and 4s. Other clubs in the area required something similar, but with flexibility in the timings. We therefore enhanced the software written for the original controller so that all of the different time series could be modified, reducing or increasing the time that the target faced the shooter by the operator at the range to meet specific and potentially changing needs. When the start button is pressed, the target turns away from the shooter. After 7 seconds the on board buzzer sounds for half a second and the target faces the shooter. 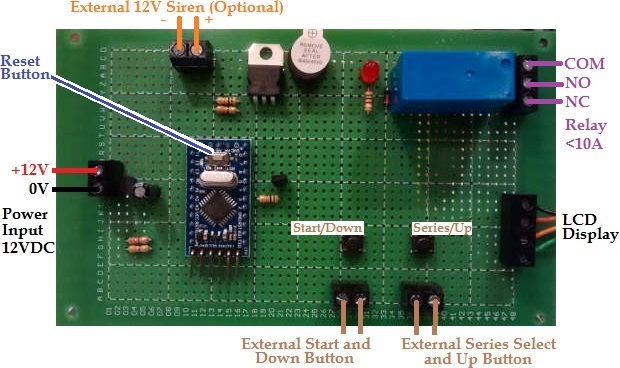 (An external 12V buzzer or siren can be connected to the terminals on the controller board if a louder sounds is required). After the user programmed time, the target turns away from the shooter (again accompanied by the sound of the buzzer), and then a further 7 seconds later, the target is turned back to face ready for the next shooter. NEW – We now also produce a modified version of this controller which allows the operator to set the edge times of the target independently for each of the series instead of using a fixed 7 seconds for all of them. 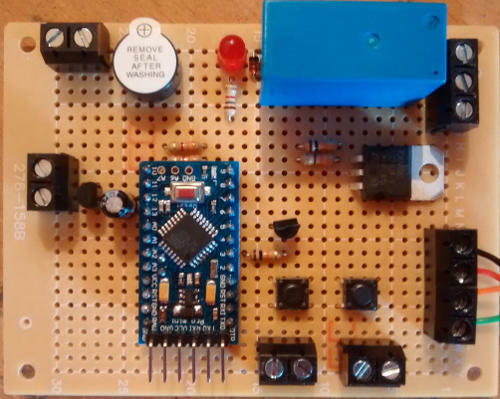 Pictured above is the version of this shooting target timer controller which we currently sell. It is physically smaller, but otherwise functionally identical to the original, and the connections are the same as per the photographic diagram at the top of this post. On the controller there are two buttons. Press button1 (Down) to run the currently displayed series. Press and hold button2 (Up) for more than half a second to be able to select from the seven saved series (using button1 to go down and button2 to go up through the list). The device is fitted with a 10A rated SPDT relay with NO, COM, and NC connections. It has the relay energised when the target is to be faced, and de-energised when the target is to be edged. You can therefore wire things up whether your solenoids need to be powered to face the target, or need to be powered to edge the target using the NO-COM or NC-COM connections respectively. When a series has run to completion, the target will edge, the screen will go blank for 7 seconds and then the target will face with the controller reset and ready to be run again. In order to modify any of the timings of the seven pre-programmed series, press and hold button1 for 5 seconds or longer. Then, use button1 to decrease the number of seconds for the selected series, or button2 to increase the number of seconds. The value will be shown on the screen as you increase or decrease it. After five seconds of inactivity (no button presses), the new displayed value will be saved under the name of the selected series – e.g. Standard Pistol 150s could become Standard Pistol 125s or whatever you have set it as. The maximum time limit is 254 seconds for any series – e.g. you could set Standard Pistol 254s, but you could not set Standard Pistol 255s or higher.